When a friend suggested we meet for a drink and named the place, I said ‘yes’ immediately. 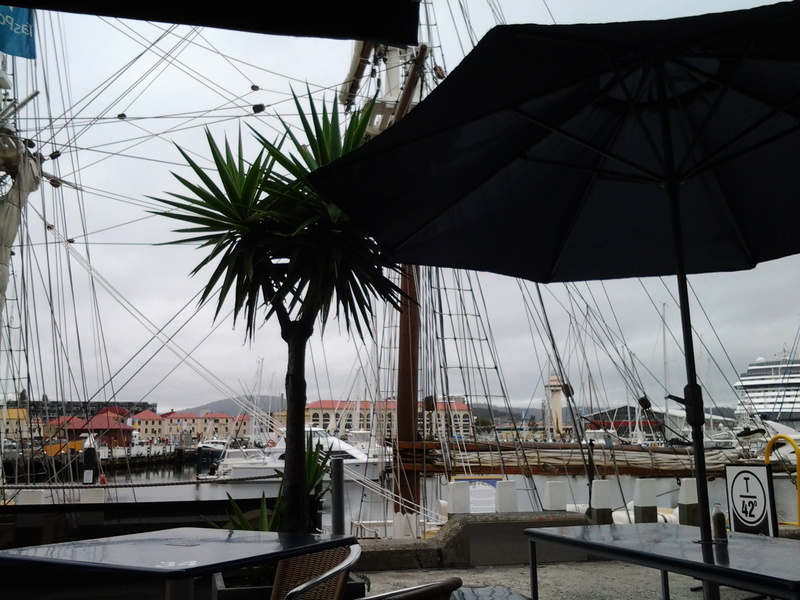 The Tavern 42 Degrees South Elizabeth St Pier Hobart ,usually known as T42, is one of my favourite haunts on the Hobart wharves edging the Derwent River. Late afternoon and into the evening a couple of days ago I enjoyed sitting outside in the fresh air while sipping a sparkling wine or two and, all the while, watching yachts and other boats and ships come and go, as tourists and locals wandered around. Exceptionally easy and pleasant. What does 42 Degrees South mean? If you read http://en.wikipedia.org/wiki/42nd_parallel_south you can see a list of the countries through which passes the 42nd latitude south of the equator (most of it passes across oceans). 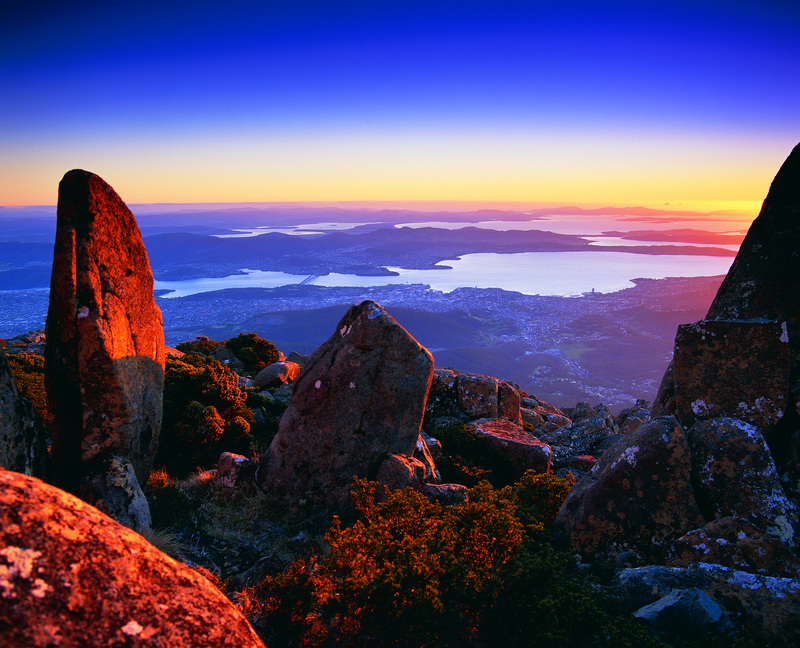 Historically Tasmania has made a noise about this parallel in order to make it easier for people elsewhere in the world to locate our island. 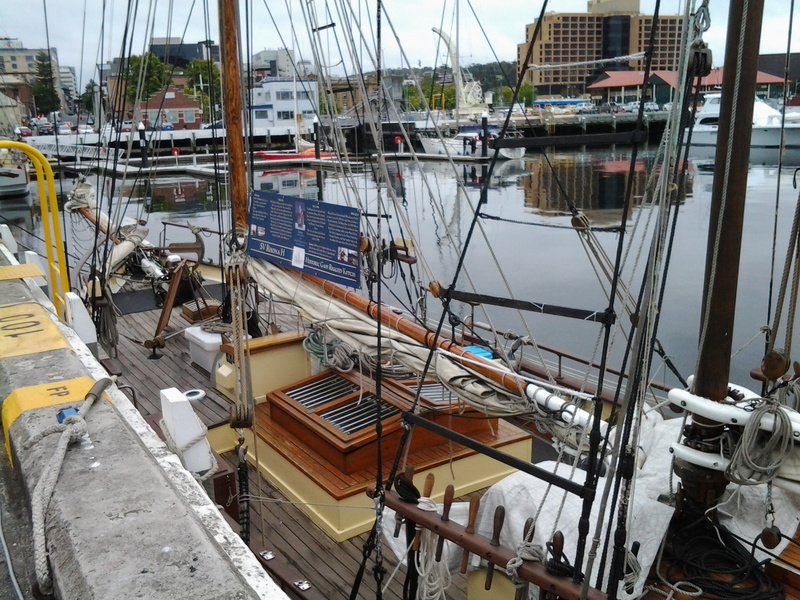 It is celebrated in an outstanding quarterly periodical aptly titled TASMANIA 40oSOUTH. More information including subscription details can be read at http://www.fortysouth.com.au. The stories and the photographs contained in each issue are nothing short of inspiring and glorious. 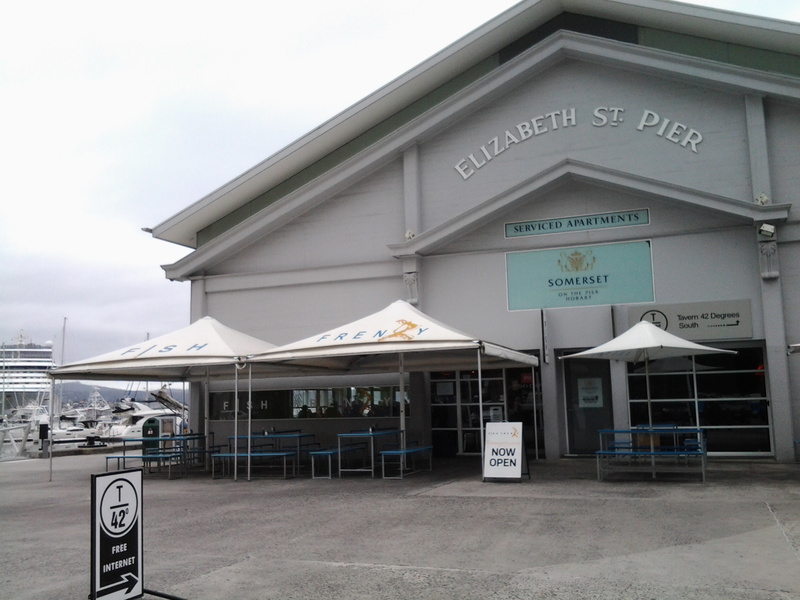 The tavern T42 on the edge of Elizabeth Pier, one of Hobart’s easily accessible wharves, also acknowledges Tasmania’s location in its name. 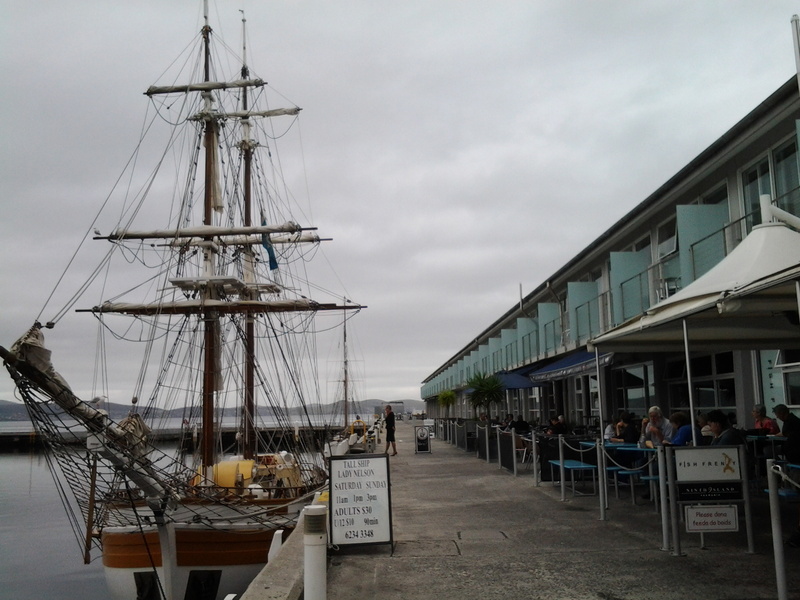 To reach the restaurant at the end of Elizabeth Street in the centre of Hobart, firstly you will see another well patronised restaurant, Fish Frenzy, then you walk either to the left or right and find T42 which has entrances both sides of the Pier. 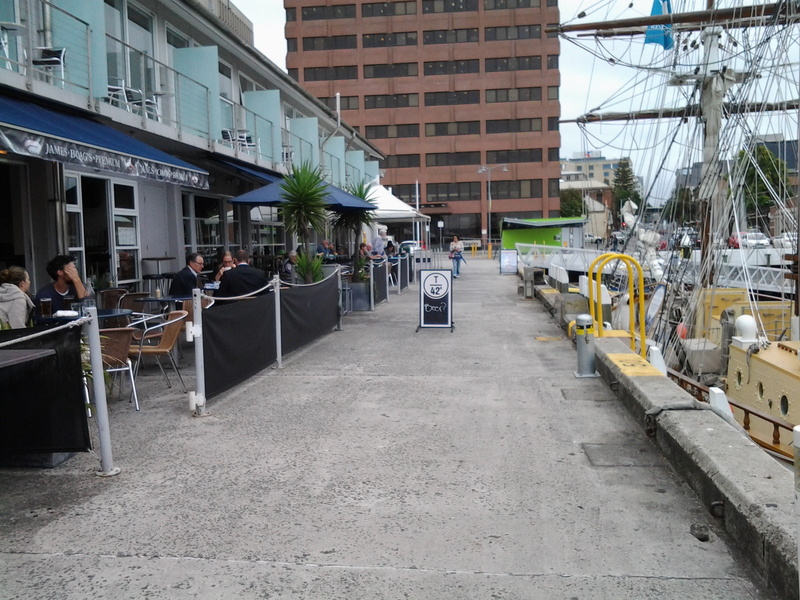 I always prefer to walk on the left side where the Lady Nelson is often moored. 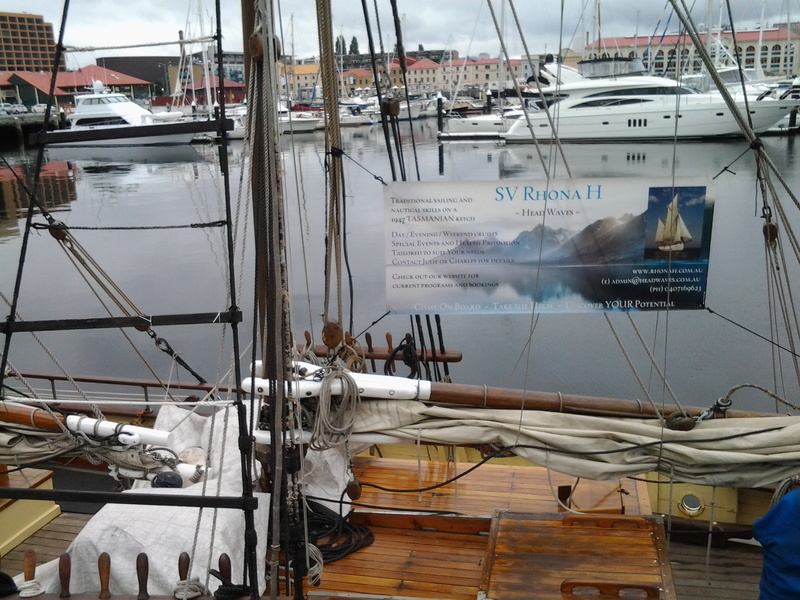 Further along, another sailing ship, the SV Rhona H was sitting pretty. Relaxing comfortably at outdoor tables I did not realise my view was so visually obstructed as the following photograph seems to indicate. Instead I found the changing view enthralling. The skies were clouded but the atmosphere was not gloomy. The day was mildly humid and not cold. The water was often mirror smooth and picture perfect. This was the place to be! And I will return. 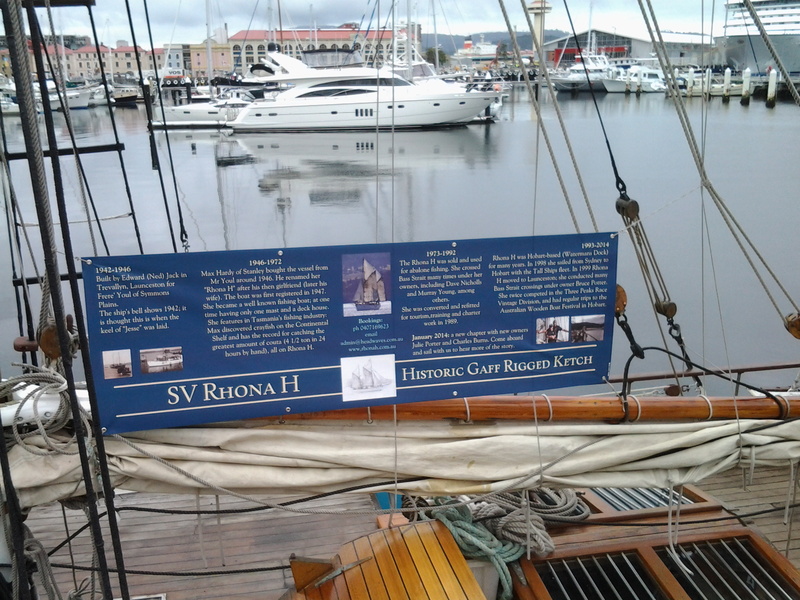 This entry was posted in Derwent River, Hobart, Tasmania, Walking and tagged Elizabeth St Pier, Fish Frenzy, Hobart, Lady Nelson, latitude, parallel, SV Rhona H, T42, TASMANIA 40oSOUTH., Tavern 42 Degrees South on February 19, 2015 by Tasmanian traveller. Well I visited my fave shop today. I just left the 4 out of the equation. T2 where I bought a packet of lemon grass and ginger tea and hibiscus and rosehip. Not a Tbag in sight! And NO alcohol which is off my menu for the time being.